When you add a modern page to a site, you add and customize web parts, which are the building blocks of your page. This article describes the Power BI report web part. 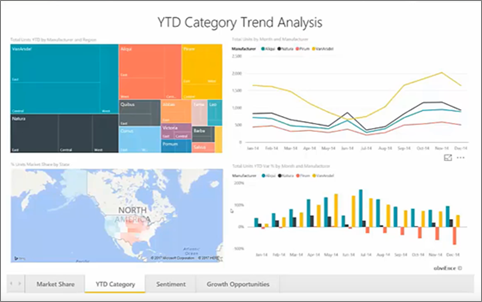 The Power BI report web part allows you to easily embed an interactive Power BI report on your page. The embedded reports are fully secure so you can easily create secure internal portals. Publishers of the Power BI report must have a Power BI Pro license. Users who view the report must have at least a Power BI Free license if the report is deployed on a Power BI Premium capacity. If the report is not deployed on a Power BI Premium capacity, the users who view the report also need a Power BI Pro license. If they do not have a Power BI license, they will need to sign-up for Power BI or start a free trial of Power BI. Embedding a report in SharePoint Online does not automatically give users permission to view the report, even if users have permissions to view the page. The permissions to view the report are set within the Power BI service. For more information, see Granting access to reports in Embed with report web part in SharePoint Online. The Power BI (preview) web part for SharePoint Online does not yet support screen readers or keyboard navigation.